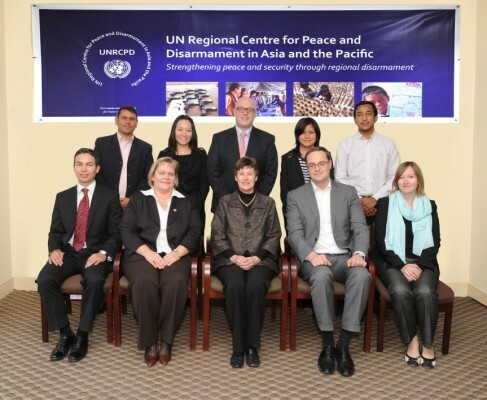 The United Nations High Representative for Disarmament Affairs, Ms. Angela Kane, paid a week-long visit to UNRCPD and Nepal in early January 2014. The purpose of the journey was for High Representative to visit UNRCPD offices and hold discussions with the staff on innovative ways for UNRCPD to deal with issues of regional peace and disarmament. The visit also provided an opportunity for High Representative to meet the UN Nepal Country Team and hold consultations with the Minister for Foreign Affairs, Mr. Madhav Prasad Ghimire, and with the Chair of the Council of Ministers Khil Raj Regmi – Nepal’s interim government Chairman. The discussions included: Nepal becoming a party to the Arms Trade Treaty, UNRCPD-Government of Nepal joint projects in the areas of Peace and Disarmament Education, and the support of the Government of Nepal to the Regional Centre. See more photos from High Representative Angela Kane’s visit to Nepal here.